All the feedback from staff has been extremely positive. Thank you for your hospitality and care of our staff and your friendliness and helpfulness. I really appreciated how you made our day there a really positive and relaxing experience. Having previously held our annual strategy sessions in Sydney, our Managing Director decided on a fresh approach and change of location for our 2013 session. Cedar Creek Falls Retreat was recommended to us, along with a number of other conference venues in Victoria. In reviewing these facilities, Cedar Creek Falls Retreat was the standout option - from their initial communication and their unique understanding of what we wanted before we knew what we wanted! The team deliver over and above what they promise right from the start. We were welcomed to the retreat with warm open fires, a sumptuous afternoon tea and were kept well fed and well-tended for the rest of our (too short) stay. They also assisted in the planning of the timing of our sessions and also helped coordinate transport to and from the retreat which was much appreciated. The retreat is a home from home with personal touches evident in every room. The food is exceptional and the staff are friendly and approachable. We wouldn’t hesitate to recommend a stay at the retreat. Our group of 30 came away having all enjoyed a change of scenery and benefiting from the experience that Cedar Creek Falls Retreat has to offer. Thank you for making our 2 day retreat so special. From preparation planning months before, through to the actual stay, your service and attention to detail was fantastic and ultimately made our retreat a great success. Cedar Creek Falls Retreat is in a wonderful, beautiful, scenic location - what makes it so special is that one group only has use at any one time! This resulted in a tangible feeling of relaxation and peace, even although we had a very full agenda for our two days. All of our team made special note of the friendliness shown throughout our stay, the superb food, the beautiful wood burning stoves, the attention to detail - including beautiful flowers everywhere and individual names on bedroom doors. Nothing seemed to be too much trouble for you both (and your staff) in terms of making our stay a memorable one and one where outcomes were achieved. I am sure we will return and thank you once again. Personally, I think you retreat is amazing and is so peaceful and calming, I really enjoyed being there. It would be wonderful if we could offer retreats on a regular basis! “the food, the company and the pampering were amazing”, “sharing experiences and the laughter made the weekend so memorable”; “the atmosphere, the people and the food were unbelievable”, “the staff were fantastic and really looked after us”. Thankyou, we cannot wait to go back. ‘Happy’ is an understatement! The Retreat exceeded all expectations…thanks to attentive support from you and all the staff! It felt like you had welcomed us all into your home! It was wonderful…relaxing…people are still talking about the food! Whilst our stay was only for 2 days, our group thoroughly enjoyed our time at the Retreat. The staff were very warm and welcoming. They also seemed to have phantom like qualities - morning and afternoon tea would appear as if out of nowhere, just at the right times, and beverages would magically replenish themselves throughout the day. But when you needed, they were there in an instant. Breakfast, lunch and dinner were delicious, the dining room was homely and congenial, and conversation flowed without effort. Despite the very wet weather, our group managed to bike, swim, run, walk and meditate according to each individual’s preference. The beautiful surroundings, inside and out, combined with the fact that we were the only group using the venue, helped our executive team connect on both a personal and professional level. We expect a significant return on our investment as a result. Our arrival at Cedar Creek Falls Retreat was one of amazement and pleasure at the tranquility and beauty of the venue for our Strategic Planning Day. We were welcomed into a very homely conference room with a wood fire burning, and the beautiful aroma of oils and candles burning. The conference room had all of the facilities we required with the added extra of being surrounded by relaxing bush land. The accommodation was perfect, quaint and very homely. Catering at Cedar Creek was the best I have ever experienced at a conference facility, wonderful morning and afternoon teas, a lovely cooked lunch, and the evening meal was certainly a winner with everyone commenting on how beautiful it was. We had a wonderful time at Cedar Creek and highly recommend it to anyone or any company looking for a venue that is something different and a lot more inviting than a conference room in the heart of the city. There was nothing that wasn’t done to make our stay perfect. All of the team will never forget our experience and we will certainly keep Cedar Creek Falls Retreat to the forefront of our minds when planning our next event. Thank you so much for a wonderfully uplifting and inviting natural space for our Staff Retreat. As a College in the Franciscan Spirit, Cedar Creek Falls Retreat offered us a connection to the environment that is central to our charism. The environment surrounding the centre is idyllic and allowed us all to enter a peaceful, spiritual depth so needed after a busy term at College. It is not easy finding a retreat space within an hour from the College that can cater for 75 staff members. Cedar Creek Falls Retreat did this without effort- in sunshine and in rain. 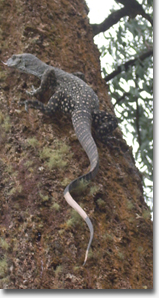 The facilities were wonderful, the food delightful with the centre's natural environment uplifting. It was wonderful to celebrate Eucharist in God's own cathedral just before Easter. Thank you Ronnie and Michael for your warmth and professionalism. The extra details were not missed. Only a 50 minute drive from the hustle and bustle of the Princess Alexandra Hospital we arrived into another dimension at the Cedar Creek Falls Retreat. Some of the senior scientists wandered around the idyllic calming environment for some minutes until finally convinced that their mobile phones would no longer operate. Although our visit was only to be a short one we were made to feel immediately welcome and we were greeted with excellent food which just kept on coming throughout the stay. The Retreat provided a perfect staging ground for a strategic meeting with only the sounds of the birds and the pristine mountain stream to distract our thoughts. We thoroughly enjoyed the visit and plan to return again next year. Thanks to all the great team at Cedar Ck. Buckley Vann Town Planning held a business planning retreat at Cedar Creek Falls Retreat over a two day period. We found the venue's peaceful setting well suited to our requirements and the hosts were warm and friendly who attended to all our needs. The accommodation and food were excellent. I would be happy to recommend the venue to others. I would like to thank you all for the fantastic service and attention to detail that made our conference the success it was. We are all most impressed with the conference venue, accommodation facilities and the catering. Thankyou to all the staff for their excellent service and big friendly smiles. We would recommend Cedar Creek Falls to anyone to host a function at and we will definitely be back. Thankyou for providing such a beautiful venue such as Cedar Creek. I have had some really positive feed back from everyone who attended the day and our wonderful presenter thought the venue was just beautiful. I look forward to returning in the near future. As part of the Aker Solutions Engineering Development Program, Forums are part of the curriculum and we are always trying to find ways to improve, especially from a training perspective where we can get the full and undivided attention of the Young Engineers, finding the right place has always been a challenge for us. As part of the improvement process Bonnie researched the Brisbane area and in Cedar Creek Falls Retreat she found a real Gem. The venue that awaited the group was secluded, tranquil, compact and provided a fresh clean environment and atmosphere to work in, what more could we ask for. The limited access to the outside world by phone and Internet certainly fulfilled our requirements to get the group away from it all. The accommodation was first class and the meals were just like being at home, and the cakes well, they found the spot every time. The lounge where we spent the evenings was comfortable and provided an excellent ambience to end the day. The group feedback indicated that we were all treated as an extension to the family by our hosts, which we think is the best complement we could pay. Bonnie and I and on behalf of the Brisbane Engineers of Aker Solutions, would like to say a big thank you for the hospitality that you and your staff showed us, and for making our time at Cedar Creek Falls Retreat such a memorable experience, we all hope to see you again one day. We were seeking a venue with ‘a difference’ to host our Branch Managers Conference! What we received was that and much more! As soon as we arrived, we were relaxed and made to feel comfortable. The perfect combination of the serene environment and the quality customer service from both the staff, was second to none. The beauty of Cedar Creek Falls Retreat is that not only is it a stunning location where you can forget about the hustle and bustle of modern life, but it encompasses the true sense of harmony with the environment. You have a stunning location, fantastic food and hospitality second to none. This location facilitated everything we needed to ensure a place to focus on ourselves and our business needs. The only thing we would have changed is making our stay a little longer...thank you! Thank you so much for all you did for us on our conference. My staff thought that everything was just perfect and they were particularly impressed with the food. For me, walking into that beautiful room with the fire, flowers and candles first thing that morning was very special. So thank you, again. Hopefully, I have the opportunity to visit again one day and just sit. After making the scenic drive to Cedar Creek Falls Retreat, our group was amazed at what greeted us. A fantastic retreat in a wonderful location with first class facilities & the most kind, caring & generous staff in Michael, Ronnie & team. Our two day stay included first class meals, quality accommodation, outstanding conference facilities & some serious team building around the campfire complete with toasted marshmallows! Every aspect was extremely well thought out & organised to an absolute tee, leaving our group to concentrate on the purpose of our visit. On our departure, we were farewelled by Michael & Ronnie (who we now think of as part of our Ergon Energy family). We left Cedar Creek Falls Retreat with some wonderful memories but most of all feeling relaxed, focused & ready to get back to our business. I have no hesitation in recommending this location for team buildings, workshops & conferences. Without a doubt, we will be back! Just to let you know that we really enjoyed our stay with you, in an environment that was conducive to young student leaders and their issues. Everyone noted the high quality of the food and service which sustained us through our decision making process! In particular the friendly nature of the staff, especially Ronnie and Michael may our stay memorable. We had a fantastic time at Cedar Creek Falls Retreat, what a very special place you have. The HR Team enjoyed their stay, the food was fantastic and nothing seemed to be too much trouble. We would definitely visit again should the occasion arise for us to travel to sunny Queensland again. Seventeen members of the Nudgee College leadership team spent a great weekend at Cedar Creek Falls. realise that we were surrounded by the natural environment. We felt pampered by the experience of excellent food and good service. Our team members are looking forward to our next retreat...we'll be back!!!! Fantastic food! Fantastic service! Fantastic venue! Fantastic location! A place to truly get away and focus on tasks at hand without the outside world interfering. Thankyou so much Ronnie & Michael for your hospitality and tireless efforts in making our stay most pleasant and complication free. Totally recommended! Having heard rave reviews of Cedar Creek Falls Retreat from our QLD Division, we decided to hold our annual 3 day national leadership training for our senior Member leaders there. It was a huge success! The serene surroundings, incredibly comfy facilities, delicious food and the attentiveness of our hosts, Ronnie and Michael, ensured that we had a fantastic environment for both learning and team building. It was a great experience for all of us and we hope to be back soon! Upon our arrival at Cedar Creek Falls Retreat we immediately felt relaxed in such an idyllic location. Greeted by Michael and Jann and shown the facility we were so relieved we had chosen this location for our business retreat. The food was outstanding and the hospitality we received throughout our stay was just amazing. Our individual needs were always accommodated without any trouble and it was a pleasure to deal with such competent and caring people. Our retreat was a total success and I thank Michael, Ronnie, Jann and the staff who made it so! I recently took my staff on a weekend retreat to Cedar Creek Falls Retreat. For all of us it was a marvellous time. The venue is idyllic, set amongst the forest as it is and the catering was first class. Our hosts, Michael and Ronnie were extremely obliging; nothing was a trouble for them and they made each one of us feel welcome. As a matter of fact, the staff want it to become an annual event! For an experience that is a little different for the usual beach / hotel one, I can thoroughly recommend Cedar Creek Falls Retreat. We would like to thank you for hosting our strategic planning weekend - the facilities were great and the service outstanding. Your diligence in covering every detail allowed us to concentrate on our sessions and provide a memorable experience for all of our staff. Thanks again foir doing such a great job. Thank you for your hospitality during our conference, we thoroughly enjoyed ourselves and our team haven't stopped talking about it. Your professionalism right from the planning stages to our departure was second to none. The venue, the surroundings, the food and the service was outstanding. We will have no problems in recommending your retreat to anyone who is looking for a spot to get away from it all and get some work done. All the best, once again thanks and we will be in touch when we have the dates for any future events we are holding in your area. I would like to sincerely thank you for providing our team with such a warm and inviting venue for our business strategy session. All of our team members were unanimous in their praise of the venue, the surroundings, the atmosphere and the culinary delights that you provided. All of these elements enabled us to successfully achieve the goal of our business strategy session, which was to better get to know and understand each other, and to together devise a business plan for our new financial year. The isolation of your venue, the serene surrounds and the openness and friendliness of your staff truly allowed all of us to relax but also focus on the task at hand. Thanks to you also for referring us to your associates for our team activity. It was thoroughly enjoyed by all. From all of us here at NAB Financial Planning, thank you for a great two day stay. We will certainly be advocating your venue to our business partners. Thank you for your wonderful hospitality this last Friday and Saturday. The feedback from my clients and their staff with respect to Cedar Creek Falls Retreat was incredibly positive; specifically friendliness and helpfulness of staff, facilities, catering and environment. From my standpoint, the overall facility, your flexibility and willingness to support everyone throughout the 2 days was first class. The overall program was a success thanks in no small part to the Cedar Creek Falls Retreat team. I will not hesitate to recommend you to any of my industry colleagues and look forward to working with you again in the future. Wishing you a very happy and safe festive season. Personally I would like to start by saying that you both were nothing short of a pleasure to deal with. No requests went unanswered and you were both too happy to help me out with organising the conference. Overall, the organising of this conference went extremely smoothly and with little complication and this was a direct result of your hospitality and friendliness. Overall, there have not been any negative comments regarding our conference at all (I would tell you for your own future reference). The food was nothing short of scrumptious and certainly plenty of it. The freshness and variety was exceptional and each meal was a treat. The facilities were such that it was perfect for our team due to being the only group at the venue, however with the diversity of many and varied meeting/discussion points which enabled individual team building and small group discussions. Accommodation was very restful with big comfortable beds. There was enough privacy to meet everyone's needs. The location was perfect. Just far enough out of town to allow everyone feel like they had really escaped the city, however close enough to get to for everyone from all over Brisbane under an hour. The rainforest feel, the silence of the bush and the running water of the creek was just the 'escape' that everyone needed. The Creek walk was a great team building activity and a great way to start the day before the big cooked breakfast. Although this stay at Cedar Creek was quite short, everyone in the office has requested that we go back next year. The office was rejuvenated after spending the time up in the serene and wonderful atmosphere of Cedar Creek Falls Retreat. We will definitely be back again. Thanks again Ronnie and Michael. I just wanted to say a special thank you for letting us use the facility with numbers lower than your minimum. We really appreciate you making an allowance for us. By way of feedback, my guys were very impressed with the facility, particularly the standard of food and service. They felt really welcome and thought the service was first class - always available but unobtrusive. I will certainly be recommending Cedar Creek to my contacts in the industry, as well as to my friends and business colleagues. Hopefully, we can also send some more "internal" business your way when our divisions have occasional workshops. Again, thanks so much Ronnie and Mike. I appreciate your assistance. So therefore a one liner for this would be: Making Teams stronger through peace and tranquillity. Just a short note to say thank you for all of your assistance, hospitality and professionalism, thanks in no short measure to your efforts, we have had an enjoyable and productive meeting. Could you please pass on our thanks to all of you staff and I would wish you every success in the future, when we next have a meeting in Queensland, we will certainly be in touch. Cedar Creek Falls Retreat a magical place in the beautiful rainforest of Samford area. It is condusive for teambuilding and conferencing that keeps individuals relaxed by it's natural elements. It was an absolute delight and treat to take our young people to cedar Creek for our committee training. They didn't stop ravening about for at least a month afterwards and as an organizer I couldn't say enough for Ronnie and Michael who made our stay warm and welcoming and easy to put together. What a treat! Thank you for a lovely time! 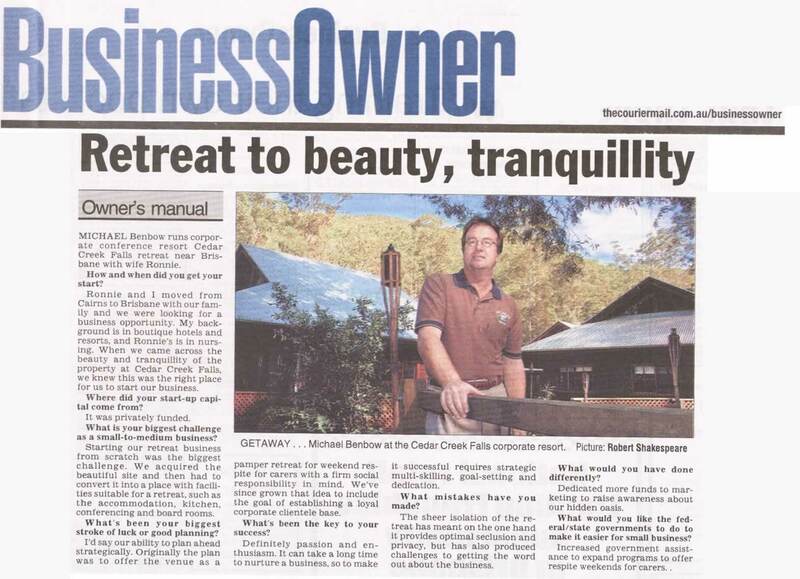 Initially we chose the Cedar Creek Falls Retreat as the venue for our Corporate Planning Workshop due to its close proximity to Brisbane and the fact that we would have sole occupancy during our stay over the two days. What we found on our arrival was a well designed venue from both a business and a personal perspective. The work areas were well equipped and the accommodation was very comfortable. Throughout, the service was excellent and the food and standard of cooking was of the highest quality. We have no hesitation in recommending to any organisation this venue for your next corporate gathering. On behalf of the team and I, please accept our gratitude and thanks for the hosting of our 2006 Management Retreat. Without doubt, this was an exceptional two day experience for us all. We had an intensive course program, and your venue and services provided the perfect deviations when required. In particular, the walk to the falls on Monday afternoon was used to break the morning and afternoon sessions. It became a great adjunct to some of the team building exercises we had in our program. I would also like to make mention to the quality of the food and service provided by yourselves and your great team of staff. The lunches were healthy and ensured we were energetic in the afternoons, and the gourmet BBQ dinner was excellent. You should take great pride in that my Chef commented specifically about the quality and the excellent value for the quality of the cuts provided. I just thought it tasted great!!!! And finally, but most valuably, all of us recognise the venue and its location. It's a fantastic setup for a group of our size. It's convenient to CBD Brisbane. but who would have guessed such a beautiful and tranquil setting. Absolutely nature at its best. Again, from my team and I, congratulations, you have our full endorsement. Cedar Creek Falls Rainforest Retreat was an amazing surprise and the perfect location for our planning workshop; providing us with a distraction free location to focus our minds to the task at hand and a relaxed environment to retreat in after hours. The hospitality was sensational and the food was incredible. We would recommend it to anyone as the ideal location to inspire, motivate and unwind!! Thank you so much for allowing us to use your wonderful venue for our retreat. The venue and your hospitality were perfect and made a huge difference to everyone who attended. I hope we'll be able to stay again some time. Cedar Creek Lodge was the perfect destination for our small group corporate team gathering. The environment was the ideal backdrop for team building and provided a relaxed environment in which we could get to know one another but also, engage in some effective brainstorming and debate. The service was wonderful, and the great food and ambience really made for a special team gathering. Thanks to Michael and his team for a great few days away from the rat race. As a regular (facilitator) user of venues across Australia - What a "Diamond" find. Michael & Ronnie's passion for thier guests matched our passion for learning and creativity. Thank you both for "filling" our fuel tanks to maximise our thinking in a space that created "MAGIC" for all participants. A great venue to 'get away' from the hussle and bussle of work. Time to reflect and a perfect place to build friendships amongst workmates. Ronnie & Mike, thanks for being terrific hosts. Thanks also to Simon of Executive Excellence for bringing us here and making the experience special and professionally invigorating.